Nobumichi Tosa treated us to a wacky, nonsensical performance on the third day of the Design Indaba. He appeared on stage strapped into one of his absurd contraptions and proceeded to act out a ceremonial dance. His mock formal greeting was punctuated with loud sounds produced by his strange instrument-outfit. Nobumichi Tosha introduced us to his company, Maywa Denki. Maywa Denki is a Japanese “nonsense company” that teeters on the cusp between fine art and design. Its products are absurd instruments and devices. For example, this fish skeleton power cord, an example of the “Naki” or fish inspired range of Maywa Denki. 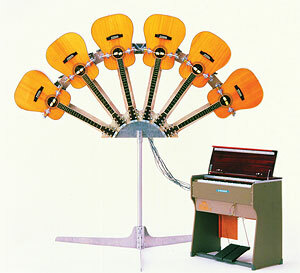 In this baroque guitar organ, each guitar has its own set of knockers which are controlled from the organ’s keyboard. The result is a rattling, clanging musical cacophony. Some further uses of knockers can be seen in this screen shot – it portrays a tap dancing device. The user has two keyboards strapped to their wrists. Pressing on the keys make the knocker “toes” on their shoes move up and down and produces a tapping sound. Here is a video in which the principles of Maywa Denki is demonstrated, from the Tsukuba instruments to the amazing Edelweis “seamoons”. Nobumichi Tosa is also responsible for a parrallell project called “Edelweis”. It also involves a number of musical devices, but these are altogether more elaborate. The video above shows the “seamoons” which are machines with lungs and vocal chords which “sing” on command from a computer. Here is a video of a live Edelweis performance. There is a whole family of knock men. 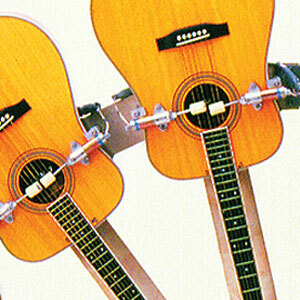 Each one makes sounds in their own way: by plucking strings, rotating hollow tubes or rattling. This watch pictured below is typical of Maywa Denki’s po-faced humour. To tell the time, you have to phone the atomic clock using the old fashioned rotary dial. Then the watch “tells you the time”. Here is another video of a Maywa Denki demonstration. This story combines the serious and the whimsical. The boy travels on a space ship powered by apples (apples, Newton, gravity, get it?) but his mission is to find love in a time of doubt. These are just some of the witty and sometimes cruel inventions. And what is their purpose? The closest Nobumichi Tosa came to providing a rationale for his work was in describing a Japanese aristocrat who develops the first origami crane pattern. “Sometimes I make only one” . Is the implication that the ideas ignite other ideas, and make innovation possible?